Hong Kong will take a 23-point advantage into the second leg of their Rugby World Cup 2019 play-off with the Cook Islands with a place in the global repechage within touching distance. Hong Kong claimed the upper hand in their Rugby World Cup 2019 play-off with the Cook Islands after winning the first leg 26-3 at BCI Stadium in Rarotonga on Saturday. The winner of the home-and-away play-off will join Canada and two other teams in the global repechage tournament in November which will determine the 20th and final qualifier for Japan 2019. Hong Kong managed to hold the Cook Islands try-less in the first test match between the nations with the return leg taking place at Hong Kong Football Club next Saturday. “It was an outstanding performance,” said Hong Kong coach Leigh Jones. “I don’t get overly excited about things, but I think it was an historic day for Hong Kong. Cook Islands brought everyone back and they have some top-quality players in that side but our performance was just outstanding. “It was a tough game and that was a hell of a win. Ahead of the game, we talked about every point being precious, whether we are giving them away or getting them. It was a great performance and the boys are celebrating now, but if you look at them, they are also grounded. They know we have to do the same next week. 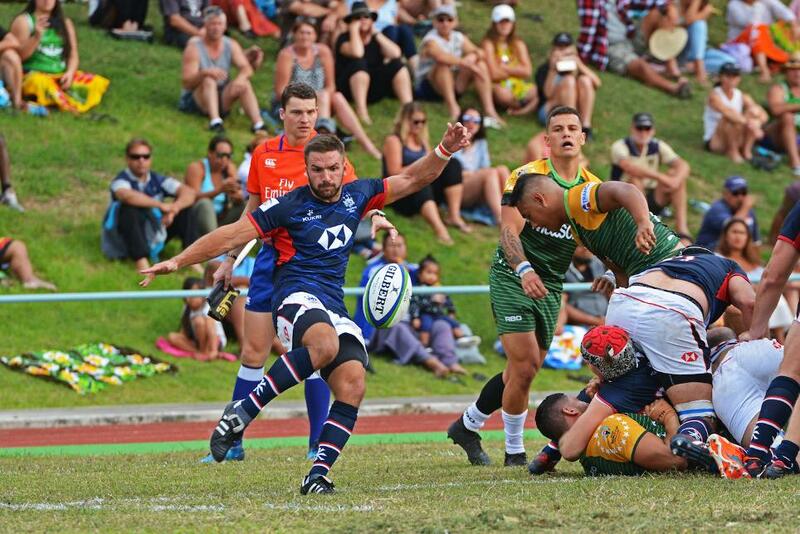 Hong Kong stormed deep into Cook Islands territory from the kick-off to set up their first try, number eight Thomas Lamboley crossed the line in the third minute after a series of well-executed attacking phases. Fly-half Matt Rosslee missed the conversion attempt, setting a pattern as he missed all four conversions, but he was more accurate on his penalty attempts, slotting tough chances on either side of half-time to help maintain the Asian side’s lead. Hong Kong increased their lead in the 12th minute after Jack Neville took a sneaky reverse pass from centre Lex Kalecka. Cutting against the defence Neville created enough space to put scrum-half Liam Slatem over in the corner. Cook Islands scored their only points of the game through Greg Mullany’s penalty to cut the deficit to 10-3 after 23 minutes, but Hong Kong’s response was swift with Slatem’s pass sending winger Conor Hartley over. Rosslee added a penalty to give Hong Kong an 18-3 lead at half-time. The home side continued to improve in the second half and a swirling wind made it difficult for Hong Kong to add to their tally with more than another Roslee penalty. A fourth try did eventually come through Max Woodward, who only moments earlier had made a try-saving tackle, finishing off some great interplay with winger Salom Yiu Kam-shing.